This is a classic cake that was inspired by a Raymond Blanc interpretation of a British classic! Easy to make, it delights the taste buds with its tangy lemon flavour which is balanced by the sweetness of sponge and the delicious crunch of the glaze. Preheat oven to 180 degrees, butter a loaf tin and line with the greaseproof paper. Grate three lemons and save only the zest. Whisk the eggs, cream, sugar, lemon zest, kirsch, salt and warmed butter in a mixing bowl. Then sift the flour and baking powder in a separate bowl and gradually add it to the mixture, whisking until it is a smooth batter. Pour it into the prepared tin and bake for 50 -60 mins at 180 degrees. Test the cake after 50 mins with a knife. If the inserted knife comes out clean, the cake is ready. Remove from oven and leave to cool for 10 minutes. Leave the oven on. Meanwhile heat up the apricot jam until it has reduced to a smooth gel and then brush the entire cake with it. Leave for 5 minutes. Then prepare the lemon glaze. 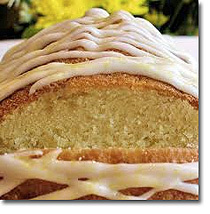 Mix the lemon zest, lemon juice and icing sugar and heat in a small pan until the sugar has completely dissolved. Brush the glaze all over the cake and leave for a few minutes to set. Then, turn off the oven and pop the cake back in for 3-5 minute until the glaze has become clear and translucent.